We're planning a Guerrilla Gardening event to celebrate International Biodiversity Day (this Friday, though the actual planting will not fall on the same day). 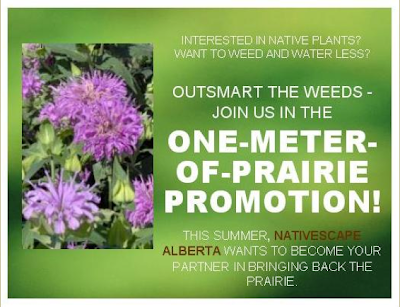 The Edmonton Naturalization Group and Bedrock Seeds have agreed to provide the group with native Alberta perennials. The only thing we need is a currently unloved, publicly visible location. If you think you might have a location in mind please, please post it in the Facebook discussion board by following the link below or as a comment at the end of this post. In addition, I'm looking for more people interested in taking on more of a leadership role in the group. I'm loving the challenge, and am more then willing but don't want to run the risk of spreading myself thin. Alberta Avenue Event a Success!! A big thank you to all the Guerrilla's (not all shown in picture) who helped make yesterday's event on Alberta Avenue a huge success and to the community for helping us out with ten flats of plants! Dare I say our most successful event yet?. - Flower beds (annuals) against a construction site fence planted on either side of a Canada Post mailbox. 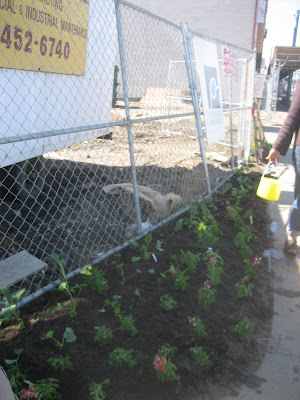 -Flower bed (annuals and native perennials) under a billboard. 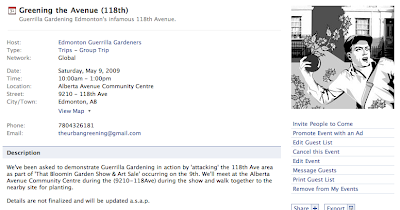 In addition, I'd like to welcome our 300th member to the Edmonton Guerrilla Gardeners Facebook Group!